Home > Public Information > Public Releases > "William Herschel, Astronomer and Musician"
"William Herschel, astrónomo y músico"
La Palma Music Festival gathers some of the best classical musicians from around the world. This year the Festival will pay tribute to William Herschel (1738-1822), the musician who became one of the most famous astronomers of his time. The Festival Orchestra directed by Thomas Mandl will perform William Herschel's Symphony No.8 at Teatro Circo de Marte in Santa Cruz de La Palma on Tuesday 7th June. 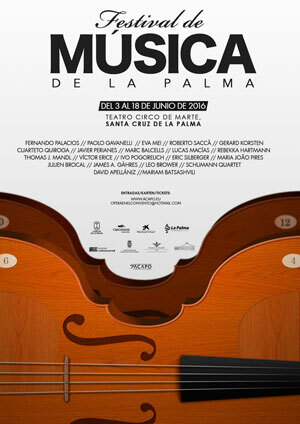 Poster of La Palma Music Festival 2016. This is the first time that an orchestra will play a work by Herschel on La Palma. Coinciding with this event, and almost 30 years after the first light of the William Herschel Telescope, the ING Director Marc Balcells will give a talk entitled "William Herschel, astrónomo y músico" at 20:30 on the 6th of June at Espacio Cultural Rafael Daranas, Fundación CajaCanarias, Santa Cruz de La Palma. Free admission.